(L- R standing) Associate Director of BC3 Education Foundation Michelle Jamieson, scholarship recipients Autumn Groves, Tyler Anthony, William Gunn, Nash Ridgley, Tomianne Anderson, scholarship chairperson Matt Walley, Wolves Club president Mike DeOtto, CCBC Executive Director Kolton Codner. (L-R seated) Grace Blake, Taydum Rhodes and Neisa Carsele, not pictured Daija Durbin & Jaylin Tuttle. at their annual scholarship dinner on May 20 at the Connoquenessing Country Club. 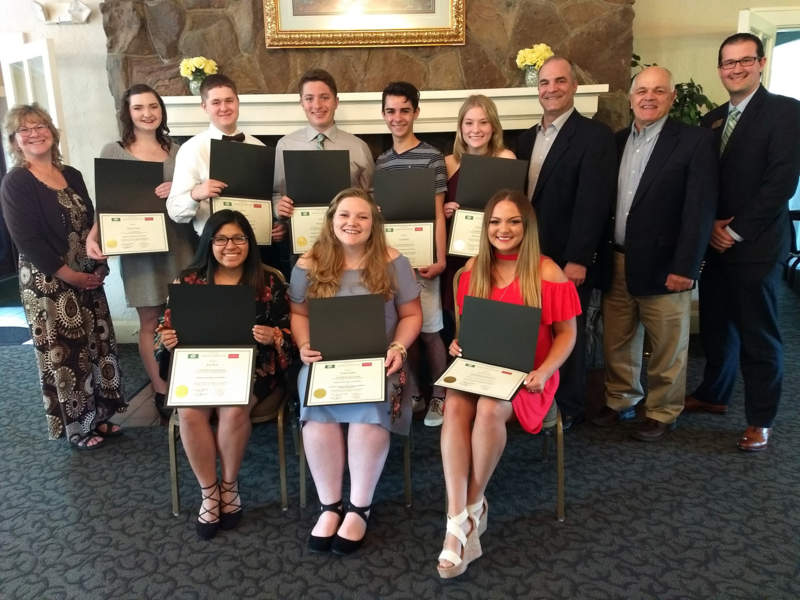 The Wolves Club announced that $14,930 in scholarships will be awarded this year to a total of ten Lincoln and Riverside seniors to help fund their college education. Lincoln high school senior Neisa Carsele was announced as the $5,000 recipient. She is the daughter of Rocky and Kristen Carsele of Ellwood City. Neisa plans to attend Penn State University and major in Biology. Taydum Rhodes, a Lincoln high school senior, received a $2,500 scholarship. She is the daughter of Rob and Jacque Kyle of New Castle. Taydum plans to attend Lock Haven University to become a Physician’s Assistant. Three $1,500 Scholarships were awarded to Lincoln seniors, Daija Durbin and Grace Blake and to Riverside senior Tomianne Anderson. Daija is the daughter of Heather Durbin of Ellwood City and will attend Slippery Rock University; her major is yet to be decided. Most likely that will be a degree in Sciences with a further scholarship in PhD. Community College of Beaver County to major in Nursing. majoring in Middle Level Education – Concentration: Mathematics. William Gunn, both receiving the Liberty Hope Scholarship funded by Dennis Gottuso, a former Wolves Club scholarship recipient. Lincoln high school senior Jaylin Tuttle received the other $500 scholarship award in memory of Mary Ann Celli, funded by the Tony J. Celli family. Nash Ridley’s is the son of Don and Sheri Ridgley of Fombell and he will be attending the University of Pittsburgh to major in Pre-Med. William Gunn is the son of Gregg and Tim Gunn of Beaver Falls. He will attend Washington & Jefferson College and major in Pre-Med. Jaylin is the daughter of Jay Tuttle of Ellwood. Jaylin will attend Duquesne University majoring in Pharmacy. Tyler Anthony received the Petti Community College of Beaver County $710 Memorial Grant. Guidance Counselor April Thellman presented the awards to the Lincoln high school seniors, English teacher Jackie Pinchot presented the awards to the Riverside high school seniors, Associate Director of BC3 Education Foundation Michelle Jamieson presented theBC3 award and CCBC Executive Director Kolton Codner presented the CCBC award. The scholarship awardees were invited to offer a few remarks. All focused on gratitude for the generous support of the Wolves Club scholarships enabling them to further pursue their educational goals. For their contributions to the scholarship and grant program, a special note of appreciation was expressed, on behalf of the Wolves Club, by Master of Ceremonies Denny Boariu, to the Anthony and Helen Celli Family, the Mary Ann Celli Family, Dennis Gottuso and the Petti Family with a “special well done” to Herman Petti Jr.
Ed Leymarie, Jarret Gibbons, Nick Mancini and Herman Petti Jr.
Father John Schmidt, pastor of Saint Elias Romanian Orthodox Church gave the invocation and benediction.